architectural style of the area, respecting its harmony with the natural environment. Our programs cover the majority of tourism categories including cultural, adventure and ecotourism. 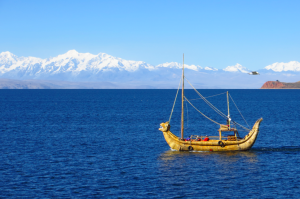 Each one demonstrates the beauty and richness of Lake Titicaca as well as the great cultural legacy of its pre-Colombian and colonial treasures. In a sustainable way, where the tourist operations with overnight are based in our ecolodge “La Estancia”, located on the Island of the Sun.A project that uses the pillars of ecotourism, which are: The respect and use of the traditional architecture, use of alternative energy such as solar, treatment and recycling of sewage water, waste management, reforestation and direct community participation. Don,t miss the amazing sunrise! 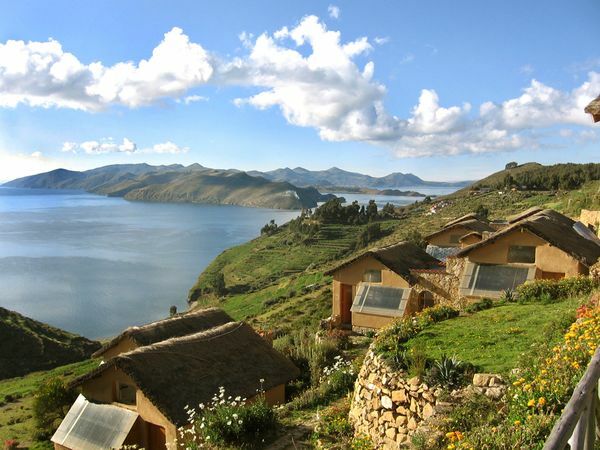 In describing the main tourist activities, we should first point out that we are in the heart of Lake Titicaca which, at an altitude of 3,810 m. or 12,497 ft., is the highest navigable lake in the world. 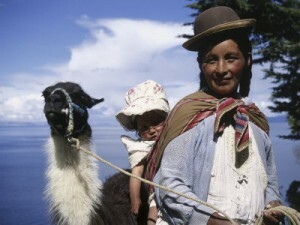 Due to its natural influence, complemented by the cordillera of the Andes, the Lake Titicaca area was the main centre of development of Andean civilization. A civilization with its roots in mythology, which describes how the first two Incas, Manco Kapac and Mama Ocllo, were born here and later went to Cuzco to found the Inca empire.Many traditions are kept alive and show us what the social structure of this culture was like in the past. For example, the use of the old terraces for agriculture avoids erosion, makes better use of the steep hillsides and improves irrigation. Religion is still closely linked to nature (sun, moon, earth, mountains, storms, rain, etc.) and its effects. Finally, social traditions such as music, clothing and way of life are still maintained.Just walking its trails or admiring the landscape will transport you to ancient worlds. 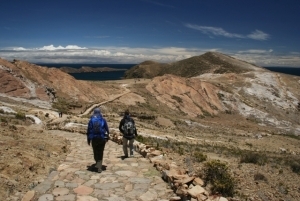 After landing near the Inca ruins at Pilkokaina, you have about one hour’s walk to the ecolodge. The first part is steep, then the path slopes more gently, following the ridge of the hillside, passing the village of Yumani, through agricultural terraces of pre-Columbian origin. *Hiking in the surrounding area. *Cross cultural exchange with the Aymara communities. *Mystical ceremonies in this land sacred to the Incas closely linked to nature. *Development of interactive projects to involve the community in ecotourism, with seminars and workshops focusing on culture, services, outdoor adventure activities, music, gastronomy, etc. *An ideal place to relax and enjoy the peace and beauty of the area. *Archaeological trips to different ruins, trails, agricultural terraces, local museums and the Sacred Stone. 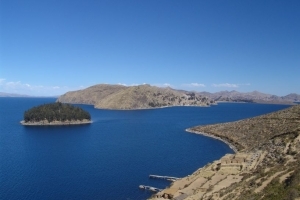 * Trips relating to the whole tourist circuit of the lake, including the town of Copacabana, the Island of the Moon and connections to La Paz or Puno (Peru). The ecolodge was built on the principles of sustainable tourism. From an economic and social point of view it supports the local Aymara community by providing them with permanent and temporary jobs, after appropriate training. With regard to environmental considerations, the cottages have been built over restored pre-Inca agricultural terraces (tacanas), blending in well with the surrounding landscape and local architecture. Solar energy is used to heat the water and passive solar heating in the cottages, which are at an altitude of nearly 4,000 m. Waste water is treated and recycled and native plants have been reintroduced. *15 cottages built in the local Andean architectural style, with adobe bricks and thatch roofs. 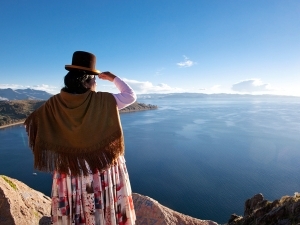 All rooms have spectacular views of the lake and the Cordillera Real of the Andes. *Comfortable restaurant and bar, with a great view of the lake and snow-capped mountains. *Capacity for 40 people, all rooms with private bathrooms. *Restoration of pre-Inca terraces to maintain the local landscape. *Use of passive solar energy, using the Trombe method, with black boxes attached to the cottages for heating by natural methods. *Hot water provided from solar energy panels. *Recycling of waste water three times. *Garden, with plans to reintroduce native plants and build a greenhouse to produce vegetables for use at the ecolodge. *Involvement of the Aymara community of La Estancia in the lodge’s work. *Community micro-enterprises in the process of development, focussing on crafts, agricultural production, fishing and Andean mythology.